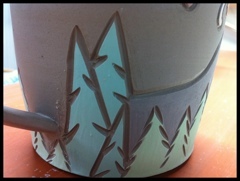 I have started making the specialty mugs for this year’s sock summit. The theme has been so fun to play with! I start by making watercolors of my ideas. It is a quick easy way to play with color and layering. I’m able to use the same brushes I use for my clay work, and it’s tidy enough that I can paint almost anywhere. After I hone in on an idea I move on to painting with ceramic pigments on handleless cups. These cups serve as ceramic “sketchbooks”. I get a better idea of color and texture in the same media as the finished piece. The cups allow me to play with my ideas, layout, and carving. Some of the motifs took too long to execute, but were too fun to let go. Look for some of those in the auction before the opening ceremonies. 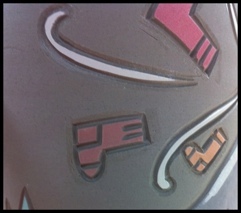 This entry was posted in studio and tagged jenniethepotter, mugs, socksummit on June 12, 2011 by Jennie. Is there any way for someone who can’t make it to Sock Summit to get one of these mugs? I love the little socks. I’m making these pieces specifically for attendees of this year’s event. I will be making pieces in a similar vein, but less geographically specific, for my next update. Is there any way to pre-order a mug and pick it up at Sock Summit? I missed out in 20o9 and this year I wont be able to get to the show til Saturday, so I’m afraid they’ll all be gone! I’ll be dividing my stock so I have a few available each day. Hopefully, that will make them available to everyone interested! Oh cool! I’ll keep my fingers crossed for the weekend! Hi Jennie the Potter! I am so excited to see you this year at Sock Summit. The mugs are beautiful. As lifetime resident of Oregon, and a lover of all things Knitty, the mugs are amazing and speak to the beauty of Oregon and socks. Can’t wait to buy one! See you soon!